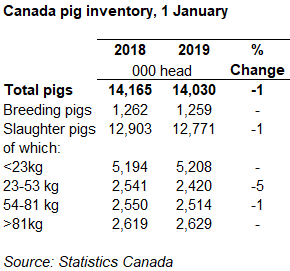 Statistics Canada said that the size of the Canadian pig herd on January 1, 2018 was 1% down compared to a year earlier, however, it remains above 14 million head. The data revealed that within this, the breeding herd was stable alongside the number of piglets. This suggests sow productivity has also remained stable. AHDB analyst Bethan Wilkins said: “Nonetheless, the overall number of slaughter pigs still declined by 1%, with reports of disease challenges influencing herd numbers. The figures show that the number of sows farrowing in the second half of 2018 was down 2% compared to a year earlier. Statistics Canada added that so far this year, six cases of porcine epidemic diarrhoea virus (PEDv) have been reported, which could also lead to challenges in the coming months.